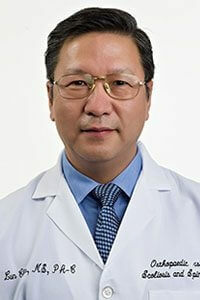 Lun Chen was a chief neurosurgeon in China. He graduated from a medical school in 1983 and completed his neurosurgery fellowship in a high ranking Chinese medical institute. For more than 18 years Lun Chen practiced medicine before coming to the U.S. He spent about eight years studying pain management at the neurosurgery department in the Johns Hopkins before he joined in the Spine and Scoliosis Center of Towson Orthopaedic Associates. He was a winner of a prestigious national award for his research of pain management. He has handled thousands of surgical cases including spinal diseases. He is happy to have the chance to contribute his clinical experience and well developed surgical skill to our practice and to assist our spine surgeons in providing the best patient care.